Early this morning I was awakened by the ring of my girls’ alarm clock at 1:30 A.M. Having never been told to do so, I was only a little surprised to hear why the three older girls were getting up at that hour. 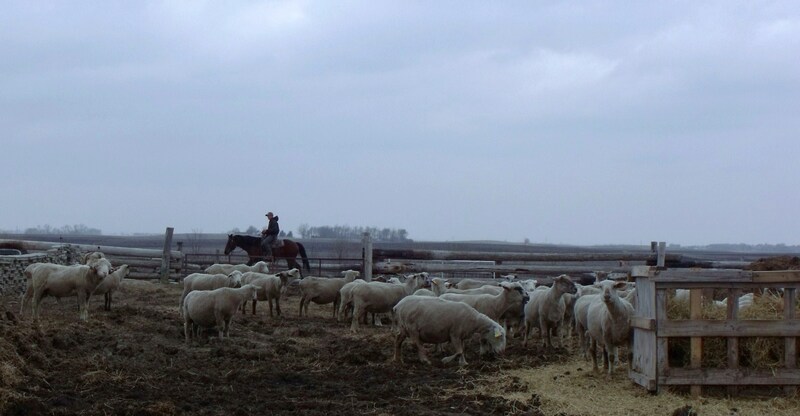 They are very dedicated to the ewes and the lambs they are bringing forth into the world. The girls have been going out to check on the lambs that have been born every night/morning 1:30 A.M. sharp. The check involves luring the mom and babies into the barn where they can be out of the wind, rain and nasty weather. It also involves feeding warm milk to bottle lambs. 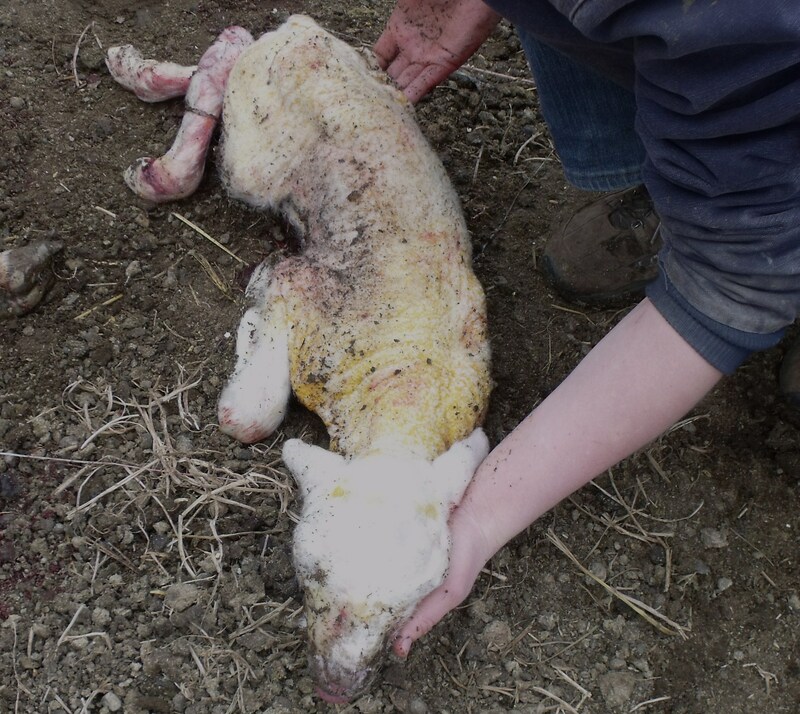 It is not easy walking backwards while holding a lamb, followed by a nervous ewe, over dirt clumps and mud. In the barn awaits soft straw, water and fresh hay. 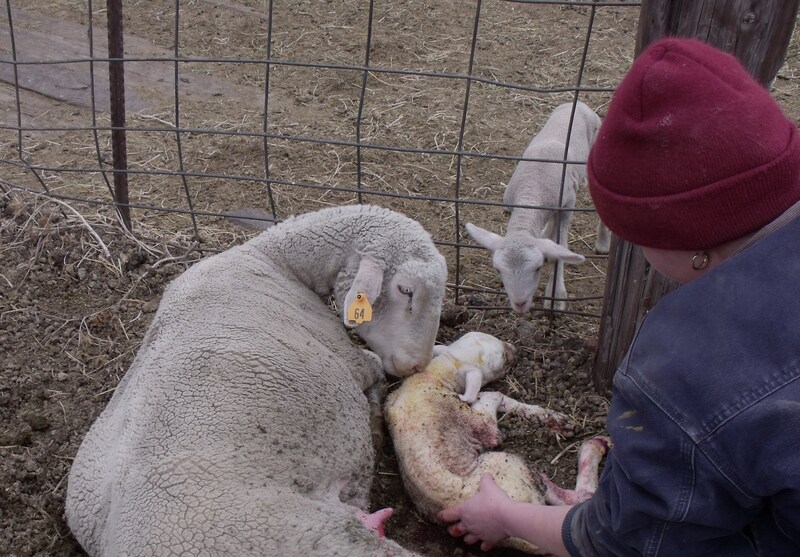 Often times it involves helping a mom along that might be having trouble birthing a very large lamb, a set of twins, triplets and rarely quads. In the dark it takes all three of them to complete these tasks. There are 63 ewes this year that are lambing what hopes to be a very good crop of lambs that have good market value this year, even better than last years price. It is an important crop for our little farm among a variety of other income generating side lines. Anyone who raises sheep knows exactly why we hear about sheep so often during Mass and read about them in the Bible, why we are often compared to them in many a sermon or homily. They do take management and need to be watched and protected! Records are kept on each of the moms and those who are not very good at mothering skills have to be culled. Good moms with hardy babies will be kept in anticipation of good blood lines, genetics do count. The record keeping is as important as many of the other tasks involved in lambing. Some ewes just won’t take care of a their babies and then we have to bottle feed them. Any mom out there knows what it is like to have to bottle feed babies, not only is it time-consuming, but it has to be clean and on time. Two of the quads have to be bottle fed so far because the mother does not have enough milk for 4 babies. Also one of the triplets has to be bottle fed. Yesterday, while planting well over 600 onion plants, we heard a ewe bleating in pain. When we went over to check out the source of such pain, we found a baby stuck, yet almost born. The ewe looked to be in terrible pain struggling to give birth. A very large lamb was caught somewhere between life and death, just too large for the poor mom to deliver without some gentle and calm assistance. Caleb and Marisa helped her out while Silvana moved another new set of babies and mom into the barn and Maggie, later helped by Caleb, lured in a set of twins. All of this was going on at the same time. The weather had changed, bringing in the lambs along with the low pressure system. The large lamb was oxygen deprived in womb and came with bloody gums and teeth from the pressure. It could not hold its head up and was limp. Isabella and Mario were sent off running for cotton rags stored in the barn for drying and warming newborn lambs. With lots of rubbing and encouragement Marisa coaxed it to breath and gave it to the mom to lick clean. This was also important to the mom who needed her baby just as much as the baby needed its mom. Very similar to humans; we need to nurse our young very soon after birth, holding, cuddling and kissing them. Later they were both moved into the barn and Clayton, who was in the middle of training a horse, was summoned to tube feed the lamb the moms colostrum which first had to be hand milked. Last report the lamb was finally standing. He is now nursing on his own. We do our best and know that you won’t always be there and able to save the lambs. There are now 30 lambs born. There were 31 but one died at night when a young first time mother did not take care of it. All this since April 3, and that is with 16 ewes having lambed. All of the tasks and chores that are done on a daily basis on the farm offer a world of great experience and lessons for the kids. Each and every person, regardless of age, has an important part here. They know that they are needed and of much value. Team work and effort makes for great family relationships that we hope will be with them for their entire lives, no matter where they may go. The little ones grow up seeing how it is done from the older ones who have come and gone. Every day I am thankful that I married a farmer. After the busy day was done we had all the onions planted, waiting on a good rain that may or may not come. I am often amazed at how much can be accomplished in one day. Often we can give up a helper or two, to a sister that may need help on her farm or in her home. Yesterday it was Maggie in the afternoon that helped Frenchy pitchfork manure onto her garden. 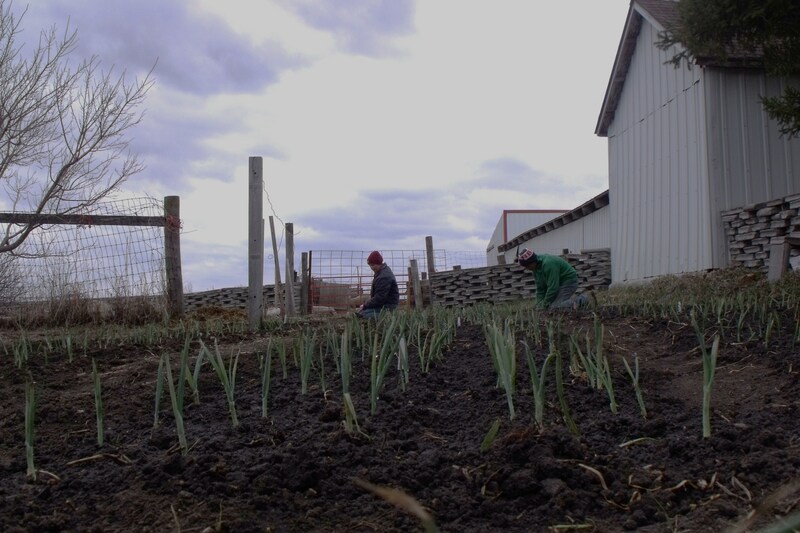 In the morning, Bella watched her niece, Maura, for Jessica so she could help Luke plant their onions. Next project is the potatoes that are out on the porch ready to be cut and placed into the dark, black, fertile Minnesota soil. Soon I will report how lambing went for this year. Below are more photos taken throughout our day. This entry was posted in LIVESTOCK and tagged Callens Farm, lambing, planting oinions. Bookmark the permalink. I love to hear about your dedicated young ones! Great to hear from you Coma! Hope all is well. Mom keeps me posted always. Never used a hair drier yet but I’ll keep that in mind. We did soak a couple of cold lambs in a hot tub which really helped. Especially with triplets. I love the name Paschal. Lamb prices are rising so I pray we have a good season:) Take care Lamby!